Lauten Audio’s LT-321 “Horizon” is a large-diaphragm, fixed-cardioid tube microphone with unusually high sensitivity (32 mV/Pa) and high output. The mic body is milled brass; reviewers comment on the excellent fit and finish. The mic’s high output level, which can be padded back by -10dB OR -20dB via a switch on the mic body, makes getting a good sound less reliant on having a high-end mic pre in the signal path. The large-diaphragm capsule measures 32mm in diameter, with a 26mm diaphragm made of imported German Mylar from Dupont. 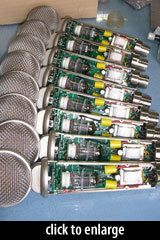 The amplifier circuit uses a military-grade NOS pentode, a 6J1, as does the input stage of Lauten’s dual-tube Oceanus. 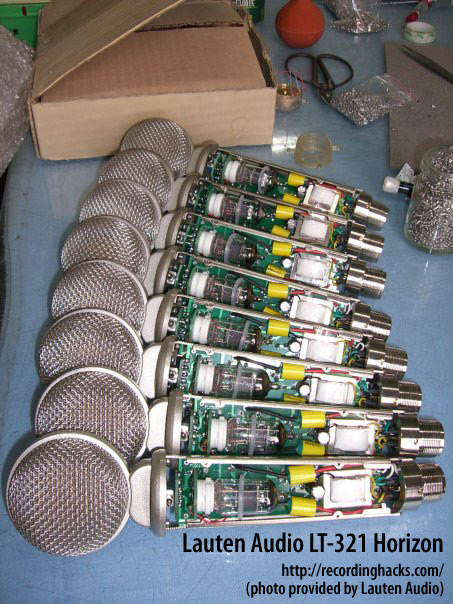 These tubes were considered “scientific” grade when manufactured by Peking Electron in the early 1980s, and compare to a Mullard M8100. The output circuit uses a custom-wound transformer (source unknown). The Horizon ships with its dual-voltage (115v/230v) tube-mic power supply, a Gotham power cable, a mic clip, an elastic shockmount, a storage pouch for the mic, and a flight case. The Horizon excelled on percussive applications such as toms,tablas,congas and djembe.It worked especially well as an external kick-drum mic … where it captured large tight lows without sounding muffled or muddy. It is equally nice on tambourine and cymbals where crispness sans harshness is desired. With the Horizon on the outside edge of a guitar amp speaker (which I was combining with an MD 421 on the center), I was able to capture the dark tones nicely, but again got a surprisingly present top end, too. [T]his is an impressive and versatile microphone, and one that I think truly represents good value for money — provided you’re looking for a microphone with a definite sound character, rather than something that�s fundamentally neutral. The Lauten Audio LT-321 Horizon is also known as: LT-321, LT321.